What Is Implanon & Nexplanon? 1 What Is Implanon & Nexplanon? Implanon & Nexplanon are Contraceptives are readily available in this day and age and for good reason. With the world population currently censured at 7 billion and adding another billion in the next 5 years, some measures need to be adopted to stem the tide of overpopulation. Rising costs of living are convincing young men and women to adopt smaller families or even forgo early marriage. A lot of people however still want families of their own and wish to adopt effective contraceptive measures in order to prevent unwanted pregnancies. While there are a multitude of contraceptives available on the market, women are now more aware of the presence of an easy to use contraceptive in the form of subdermal implants. These implants are tiny rods no bigger than the size of a two combined matchsticks and are effective for years at a time. They work by releasing progesterone, a hormone necessary for transformation of the uterine lining into a suitable implantation site for the embryo. With high levels of progesterone, the hypothalamic-pituitary-ovary axis will not release follicle-stimulating hormone and luteinizing hormone necessary for ovum maturation and release from the ovary. An understanding of how the menstrual cycle occurs will allow us to understand how subdermal contraceptive implants work. As you can see from the diagram above, the menstrual cycle follows a distinct pattern of hormone release associated with physiologic changes in the uterus as well as the maturing ovum. In order for pregnancy to take place, the conditions must be right enough to allow conception. Every month, a woman has a menstruation which is the conclusion of a process that has failed to achieve pregnancy. It all starts with the hypothalamus where in gonadotropin hormone-releasing hormone is secreted in response to the end of the previous menstrual cycle. This hormone in turn will stimulate the anterior pituitary gland to release follicle stimulating hormone and luteinizing hormone which travel all the way down to the ovaries in women and cause the ovaries to secrete estrogen first and progesterone second. This process is highly regulated as any disturbance in any of the hormones secreted will result in an arrest of the downstream signaling pathway. In the case of progesterone implants, they constantly release progesterone into the blood stream. With a high level of progesterone circulating, the hypothalamus will assume that the luteal phase is still ongoing. This is what we call a negative feedback loop where a rise in one hormone leads to a mechanism that will allow it to fall back to normal levels. Without the release of gonadotrophin hormone-releasing hormone, there are is no release of follicle stimulating hormone or luteinizing hormone. The ovaries in turn will not secrete estrogen or progesterone. With such ease of duping the endocrine system and the ability to reverse the process by simply removing the implant once conception is desired makes this contraceptive a popular choice. 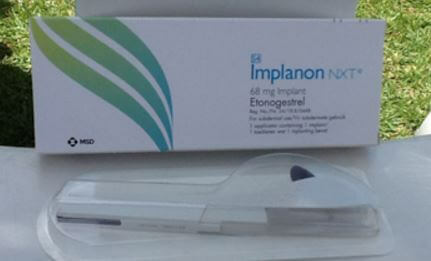 The two implants we will be discussing today are Implanon vs Nexplanon and we will try to compare them. Let’s first describe Implanon. Like all subdermal contraceptives it is a small, thin plastic rod that is inserted beneath the skin. It uses Etonogestrel which is an active metabolite of Desogestrel, a progestin (again, it’s a similar compound of progesterone). Not only does it interfere with the above mechanism as described above, it also makes the vaginal fluid viscous so that sperm have a hard time trying to fertilize the ovum. It is inserted on the first five days of a normal menstruation. After which the effects begin and contraception is effective. It also contains no estrogen which has been implicated in some breast and uterine cancers. Some medications may interfere with Implanon such as St. John’s wort and a variety of antiepileptic drugs. Discuss these with your doctor to prevent failure of contraception. What are the advantages then of Implanon? You can breastfeed with it on. Your bleeding pattern will also change and might be unpredictable at times. It pretty much has the same advantages and disadvantages as Implanon. The only difference is that 1. It is radiopaque, this means that in order to determine if it’s properly fit and in the right are it needs to be, it will show up on x-rays and computed tomography scan (CT scan) so that your medical professional can make adjustments. It’s newer and comes with a new application apparatus that makes the process even easier. Implanon insertion itself is relatively painless and has a very satisfactory safety profile. 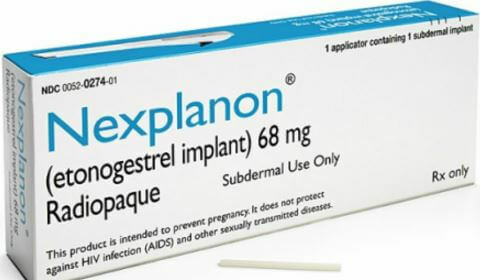 Subdermal implants are a popular choice of contraception considering that it requires absolutely no diligence on the part of the user. The patient can attach it and never have to worry about unwanted pregnancies. It doesn’t protect against sexually transmitted diseases though. The advantages and disadvantages of Implanon and Nexplanon are pretty similar but the latter is more suitable for proper documentation and assessment for fit and its even less painful on application.